One of the best advantages of a window bird feeder is the fact that you can place it right on your house or apartment window. If you live in the countryside is or in the city, this design is easy to install as you don’t need a garden or large space around the house. 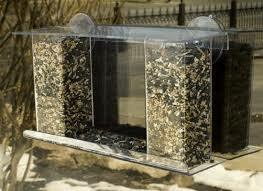 If you live in the city, you can install this window bird feeder even if you live in the building and still attract birds right up close. This design is perfect for educating kids and they can have fun keeping track of different species of birds that are coming to the feeder. Check Duncraft 74405 Songbird One Way Mirror Window Bird Feeder here. The super Song Mirrored feeder gives an up and close view of the little birds, it is made of plastic construction and accompanying one-way mirrored film. Mirrored film gives an intimate look at the birds without disturbing them, the kids specially love this stuff, because the birds are so close, you feel like you can touch them. The feeder is made with dual seed reservoirs and offers variety of seeds to be put inside, so you can attract more birds at once. The lid is difficult to open, refilling is not easy because of that. 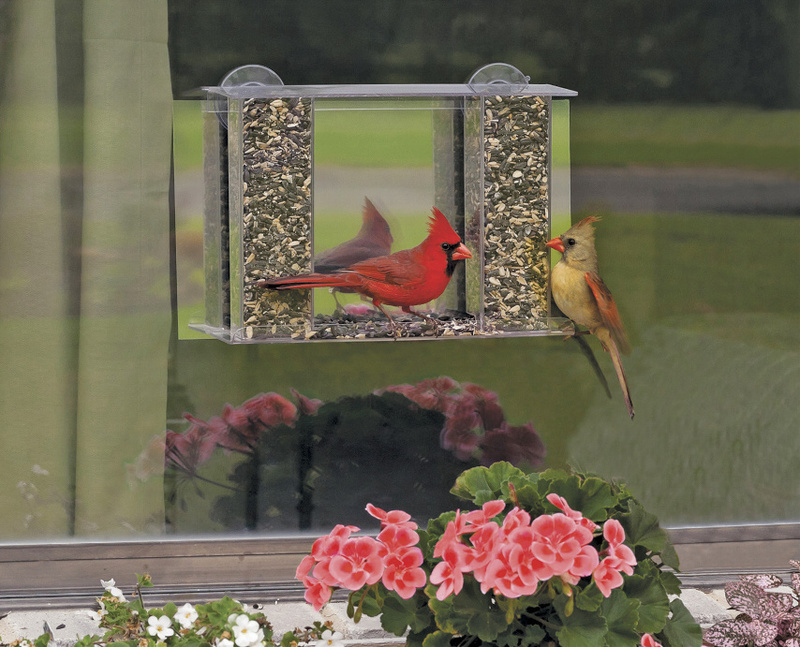 The feeder has a nice design made with clear plastic, construction that offers views of the birds at feeding, it is equipped with suction cups that are sturdy and hold the feeder to the window. The feeder is equipped with a small platform for feeding, and a perch for the birds to sit on, while the lunch is eaten. Somehow the lid of the feeder is the weakest point, the plastic can be hard to attach together, and once you manage to do it, it is hard to refill, as it is not opening all the way for easy refilling . The feeder is equipped with a mirror that provides a visual barrier, so when the bird is sitting on the perch you can come and look at the bird unnoticed. Both the feeder and the mirror are coming with easy instructions, to make sure you install it properly. It is attractive design, and gives a unique way of looking at the birds, problematic lid aside it is is a good beginner feeder, and kids will love it. Make sure that you don’t tap on the glass of the window, the birds can get scared, and you want them to come back. I like the idea of a dual reservoir , you can fill one side with mixed seed, and the other with nyjer seed, or to your liking to attract maximum number of birds. Are Songbird Window Mounted Bird Feeders squirrel or cat proof? I recommend you place it in a place where birds can see the predators coming from all sides, if you have a cat it can jump and catch the birds at feeding, this can also damage the feeder if the weight of the cat smashes it down. Squirrels can access it if it is too low to the ground, try installing it a little higher if you can. Use soap and water, it is made of plastic so it is easily washable, check for bird droppings and mold if it is raining. If you live in a city-setting you can attract many of the same birds that visit your suburban and rural neighbors. You don’t need an intricate garden or lots of acreage to provide the basics for the birds. Birds need food, water, shelter and protection and you can offer this from a small balcony or terrace, courtyard or even from your window sill. I recommend this feeder for beginners and it is a good way for city dwellers to watch birds , if you live in a building apartment this is a good way to looks at the birds, as you cannot hang classic feeders. I have spent larger part of my life in a city, and when you have a limitation on what feeder you can use, the window feeder is a good idea. Check Mirror Window Bird Feeder here.